Get your tastebuds tingling with this Asian inspired and antioxidant rich stir fry, with colourful crunchy vegies and simple ingredients and prep. 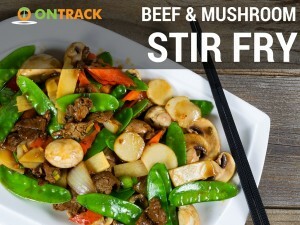 1: Place beef into a bowl, add soy sauce garlic and ginger. Toss to coat meat completely, then refrigerate for 30 minutes. Drain, keeping leftover marinade. 2: Heat oil in a non stick fry pan. Add beef and brown on a medium heat, then remove from the pan. Add to the pan the onion, cook for 1 minute, and then add remaining vegetables and stir until vegetables are just cooked, but still crunchy, stir in remaining marinade and cook for 1 minute. Return the beef and to the pan, and cook for 1 minute until heated through.